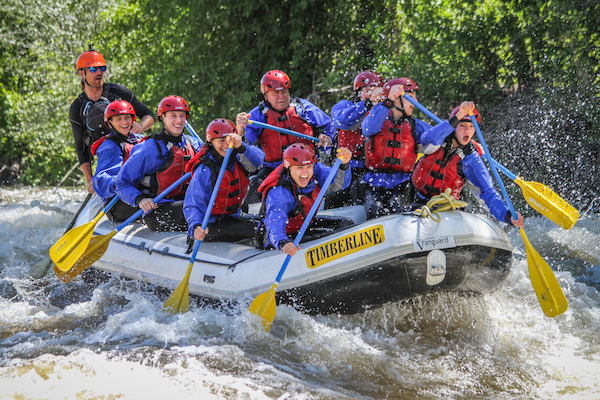 Before going on any Timberline Tours Vail rafting trip, your guide will give an important safety talk and also provide safety instructions throughout the trip, but it’s also helpful to review a few key concepts in advance. 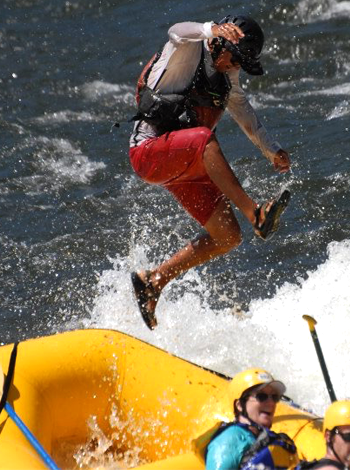 Rafting safety is an essential component of any fun and memorable trip, and Timberline’s experienced whitewater rafting guides go through rigorous training to keep their skills sharp. With personal awareness and physical fitness, rafting safety begins well before stepping inside of a raft on the day of a trip. When planning a trip, choose a trip that’s within the physical limits of each person who will be on the trip. Some rafting trips might require only light paddling, while others will require long stretches of intense, athletic paddling. Be realistic about your physical abilities and comfort level with various risk factors present on any rafting trip–and also consider how fitness and comfort level apply to each person in your group. 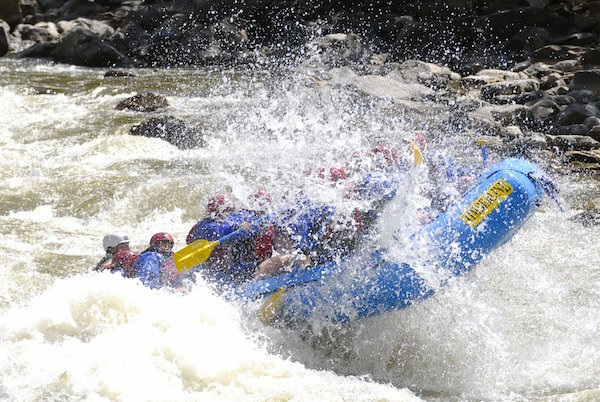 Read rafting trip descriptions carefully, and understand the international scale of river difficulty to know what class rating is most appropriate for you and your group. Dress for rafting success. See the Timberline Tours “What to Wear Rafting” blog post for details about what gear Timberline provides and what you should wear, including appropriate footwear. Work with your guide to choose gear that fits correctly, and listen to your guide’s instructions about how to wear rafting gear safely, including buckling all fasteners on your PFD (life jacket) and tightening straps to the appropriate level. Be an active listener, and be engaged during the pre-trip safety talk. Ask questions for clarification, and don’t be afraid to speak up before you leave for the trip if you do not feel comfortable with the level of risk you are assuming. Rivers are dynamic and constantly changing. For this reason, some safety guidelines are flexible to allow for the most appropriate response to changes in natural features such as rocks, trees, or shorelines. Always listen carefully to your guide’s safety instructions while on the river, and act quickly in response. When in the raft, keep one hand on your paddle’s T-grip at all times to avoid hurting yourself or others with your paddle. Paddle hard when requested, and stay in the boat! Keep toes downstream and toward the water surface to avoid entrapment. Swim aggressively to safety to avoid prolonged exposure to cold water and other natural dangers such as rocks, trees, and violent rapids. You must be active in your own rescue by swimming quickly–and with determination. Most often, Plan A is to swim back to the raft as quickly as possible. However, your guide may signal you to swim to the shore. Swim in the direction your guide signals if you are unable to hear your guide’s instructions. If you are on a rafting trip with a safety kayaker or with someone on shore positioned with a throw bag, plan to use these resources safely. If you are able to swim to a safety kayak, listen to the kayaker’s instructions about where to grab ahold (usually on the back end of the kayak). Do not pull on the kayaker or on the side of the kayak. For a rope rescue, be active in positioning yourself to grab the rope. When you have the rope, pull it close toward your body, and lie on your back while continuing to actively kick. Avoid letting the rope wrap around you. Listen to your guide’s advice for further instructions. If you are back in the raft and helping pull someone else in, pull on the life jacket’s shoulder straps instead of pulling up on a person’s arms, which can cause injury. Finally, remain calm, as making safe decisions requires a clear mind. By following these basic tips and listening carefully to your guide, we hope that you can safely enjoy the beauty of Vail rafting and all that unfolds along the way–majestic mountain views, wildlife sightings, and the thrill of a true Colorado adventure included.